My daughter has been complaining that her mouth hurts, and I thought nothing of it because she said she scratched her cheek with her fingernail. Yesterday, I finally looked in her mouth, and there was a huge canker sore, which is a small mouth ulcer. Canker sores can be caused by a minor injury to the mouth, such as my daughter’s fingernail, as well as bacteria, a faulty immune system, stress, certain foods (chocolate, coffee, strawberries, etc.) and/or a diet lacking B vitamins. I wondered if the flush of strawberries from the garden had been impacting my daughter’s canker sore, as well as her weekend full of ballet performances added stress to her little body. There is also some evidence that toothpastes containing SLS, like Tom’s of Maine, may contribute to canker sores. 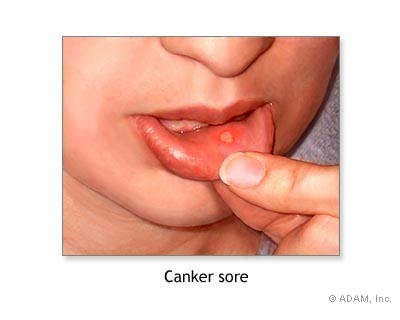 Most canker sores heal on their own within two weeks, but due to my daughter’s pain, I decided to treat it naturally with herbs and homeopathy that we already had in our home. There are other recommended herbs not included in this list, but this list reflects our current regime without making a special trip to town. Calcarea Carbonica: This homeopathic remedy is often recommended for canker sores, but like all homeopathic remedies, the remedy needs to be selected based on the individual’s symptoms beyond the sore itself. Homeopathy takes a holistic approach when choosing the correct remedy. Borax is more often used for canker sores than calcarea carbonica, but since CC is also a remedy for cradle cap, we already had it. Herbal mouth rinse: In a little bit of water, combine salt, echinacea, goldenseal, and calendula tinctures. Swish in the mouth for about 10-20 seconds. This mouth rinse tastes awful, but if your child will take it, their canker sores will heal faster. Native Americans have traditionally used echinacea and golden seal to heal open wounds, and I have witnessed these herbs amazing healing properties with my dog. By packing my dog’s wounds with golden seal, she managed to avoid surgery after a bad dog fight. B Vitamins: People whose diets lack B vitamins often have recurring canker sores. B vitamins also help with stress, which can cause or contribute to these mouth ulcers. Zinc : Zinc is another important nutrient often lacking in people’s diets who suffer from canker sores. You can usually find zinc in fruit flavored lozenges, which are much easier for children to take than swallowing capsules or pills. Multivitamins: Once again, if a poor diet is to blame, quickly boosting your child’s diet with a multivitamin may help heal the canker sore. My kids love Rainbow Light’s chewable NutriStars, which contain plant source enzymes, supporting herbs, vegetable concentrates, and superfoods. Acidophilus: Acidophilus is considered an important supplement for preventing canker sore outbreaks. Most natural yogurts contain this beneficial bacteria, but I found a children’s chewable supplement called Junior Dophilus for my son had taken antibiotics after surgery. Chamomile tea: Not only will chamomile tea help calm a child and prepare them for nighttime, this nerve tonic is useful in treating canker sores. My daughter has been drinking chamomile tea from a travel mug beside her bed, as she read in the evenings. Baking soda paste: Mix a small amount of baking soda with water and apply it directly to the canker sore. This does hurt a little, so your child may not tolerate it. Baking soda is most effective when done as soon as a sore is noticed. Since we started this regime yesterday, my daughter’s whining has subsided and she feels better. My herbalist friend also recommends vitamin C to help the immune system and licorice for inflammation, as well as lysine. Gathering additional remedies would mean a trip to town, so we will hope that our current regime will offer my daughter continued canker sore relief! Of course, if your child has any medical conditions or is on any medications, it is important to consult a health care provider before introducing herbal, natural remedies. Thanks for the advice. I had them really bad as a kid and would have loved this information. Hopefully it will help others today. I suffered from these as a kid and still get them occasionally. Taking vitamin B supplements does seem to help, but the fastest way to get rid of them in my experience is to apply hydrogen peroxide, (diluted by 50% for kids? )a couple of times per day for a few days. Speeds healing quite a bit and seems to ease the discomfort… figured you would like to know as I didn’t see it on your list. I think there are natural sources though I’ve always used the pharmaceutical stuff. thank you, i actually was wondering about this the other day. Thanks Chris! I think the issue with hydrogen peroxide and kids is that young children often don’t know how to spit it out (like fluoride toothpaste). I will let my hubby know, as he still gets canker sores. His dentist told him to use a salt water rinse. I also read that they tend to run in families. I had them as a child, but I can’t remember having one as an adult. They sure are painful! I used to get them all the time as a kid too!!! I still occasionally get them. They are painful 🙁 I hope your daughter feels better soon. I am going to have to try these out if they ever decide to return. You have really made me feel better. My son he’s 11 and he gets them periodically. However, since the fall and winter he’s had 3 or 4. I wonder if the change in seasons may have something to do with it. I was scared it could be cancerous or gum disease. Could it be a calcium deficiency.